Video driven cartoon animation. 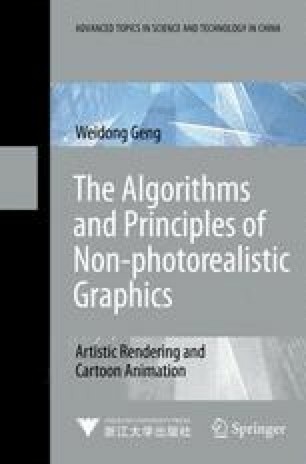 The performances of objects and actors are first extracted by image processing and computer vision techniques, etc., and then accordingly retargeted to the objects and characters in the cartoon animation sequence. Carton animation production guided by approximate 3D geometry. The objects or characters to be animated are modeled with 2.5D or 3D information, and the 3D computer animation techniques are borrowed to speed-up the production of 2D animation. Cartoon generation by artistic rendering with temporal coherence. The temporal coherence mechanisms are embedded into the artistic rendering techniques, and then the resulting cartoon sequences can be semiautomatically/ automatically generated by them. Cartoon production by “borrowing” 3D animation techniques. 3D computer graphics techniques and animation methods are employed to explore and investigate the novel artistic modeling and rendering techniques that can improve the production efficiency of 2D cartoon animation. Cartoon production by content reusing. It acquires the relevant visual and motion content from the existing cartoon animation, and applies them to the production of new cartoon animation.